After two promising seasons, Ken Hubbs’s life was tragically taken in February 1964 at the age of 22. He lost his life in a plane crash. As Santo said, his passing left many to wonder just how good he would have been. The Hubbs family resided in Colton, California, which was located in San Bernardino County, about an hour’s drive east of Los Angeles. Hubbs’s career almost never got under way; in the spring of 1942 he suffered a ruptured hernia. At the tender age of six months he was too young to undergo an operation. He was fitted with a truss, which he wore for the next five years. His doctors warned his parents that he would need to be watched closely for the rest of his life. Eventually, Hubbs grew out of the hernia and the truss became unnecessary. Hubbs was the “golden boy” at Colton Union High School. He was class president his senior year, and he earned 11 letters while competing in football, basketball, baseball, and track. Although baseball was his favorite sport and the one he wanted to play professionally, it was Hubbs’s talents on the gridiron and the hardwood that garnered him the most notice. A quarterback on the football team and a center on the basketball team, he was named a National All-American in both sports, in the same year. He was awarded the Los Angeles Examiner Trophy for being named “Best All-Around Athlete in Southern California” in 1959. But that did not mean Hubbs went unnoticed by baseball scouts. He was also being recruited heavily by colleges, especially those on the West Coast. He had narrowed his choices to the University of Southern California and Brigham Young University. As his high-school graduation day came and went, Hubbs still had not made up his mind. But Cubs scout Gene Handley was able to ink the high-school star to a contract, with a modest bonus. Hubbs was not concerned with the money. He just wanted to be a ballplayer. 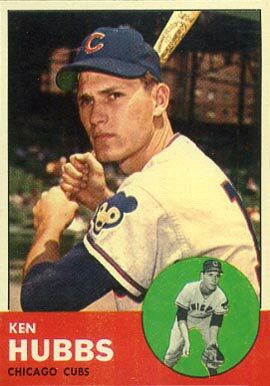 Seventeen-year-old Ken Hubbs began his career in professional baseball in 1959. He played shortstop. It seemed that no matter how well he might perform, his path to starting for the Cubs was blocked by Ernie Banks. Banks was the reigning Most Valuable Player in the National League and in 1959 was the National League MVP. Even if you were a “golden boy,” you just did not replace Mr. Cub. Hubbs started his ascent at Class D Morristown (Tennessee) of the Appalachian League. In 56 games he hit .298 with 8 homers and 50 RBIs. His solid season earned him a promotion to Class A Lancaster (Pennsylvania) of the Eastern League for 1960 and late in the season to San Antonio of the Texas League. His batting average for the two teams plunged to .217, with 7 home runs and 56 RBIs. Meanwhile, in Chicago, Cubs owner Philip K. Wrigley designed a plan under which the Cubs would operate without a manager. There would be an eight-man coaching staff that would take turns directing the Cubs and rotating through the minor-league system. This radical idea was called the College of Coaches. The eight coaches were Charlie Grimm, Harry Craft, Ripper Collins, Bobby Adams, Vedie Himsl, El Tappe, Verlon Walker, and, in the minors, Goldie Holt. To this group Wrigley added coaches Lou Klein, Freddie Martin, and Charlie Metro. Wrigley called this approach “business efficiency applied to baseball.” The idea was questioned by most, ridiculed by others. It was to take effect for the 1961 campaign. Hubbs even got into ten Cubs games as a late-season call-up. He made his major-league debut on September 10, 1961, at Wrigley Field against the Philadelphia Phillies. Hubbs started at second base and went 2-for-3 with a double (off Robin Roberts), an RBI and a run scored and played flawlessly in the field before being lifted for pinch-hitter Richie Ashburn in the 7th. (It was also the debut game for another prized Cubs prospect, Lou Brock, who went 1-for-5 on the day, but committed two errors in CF) However the Phils thumped the Cubs 14-6 as Chicago made a total of seven errors. It seemed as if Murtaugh was not the only one in the senior circuit to take notice. In the first inning of a doubleheader at San Francisco, Hubbs was struck in the left ear by a pitch thrown by the Giants’ Jack Sanford. Hubbs’s batting helmet landed about 20 feet behind him as he fell to the ground with a bruised and bloody ear. “I threw the pitch exactly where I wanted to,” explained Sanford. “High and inside. But the kid was coming in. If he had pulled back, the pitch would have missed him two feet and hit the catcher’s glove. Hubbs must have frozen.” Hubbs was taken to a hospital and x-rays revealed no fracture. He wanted to return to the ballpark and be in the lineup for the second game. The kid was a gamer, and the Cubs faithful loved his attitude. Determining that the College of Coaches concept was a failure, the front office tapped Bob Kennedy as the sole manager for the 1963 season. Kennedy, a Chicago native, was an outfielder for 16 seasons, mostly with the Chicago White Sox and the Cleveland Indians. Even though Kennedy was the head man, there were still 11 coaches on his staff. Ken Hubbs had a fear of flying. He conquered his fear by taking flying lessons during spring training in 1963. He purchased an airplane, a single-engine Cessna 172. On February 12, 1964, Hubbs flew his longtime friend Dennis Doyle to Provo, Utah. Doyle’s wife and their baby were visiting family in Provo, and Dennis’s appearance was a surprise. They were only supposed to visit for the day, but they stayed overnight and flew back the next day. It was a clear day as the plane took off around 10 A.M. Elaine Doyle watched the plane for about 10 minutes before it disappeared from sight. They were about 100 miles away, near Delta, Utah, when they encountered a winter storm coming their way. Hubbs turned the plane around and headed back to Provo. Union Pacific railroad workers reported seeing the plane returning in the direction of Provo. The plane was about four miles from the airport, two minutes away, when, it was believed, it encountered an atmospheric disturbance that sent it into a nosedive into Utah Lake. The lake lay between two mountains and was known for atmospheric turbulence. The Cessna crashed into the lake. Divers recovered their bodies at the bottom of the lake. At the age of 22, Ken Hubbs was dead. On June 26, 2002, the Chicago Cubs hosted “Ken Hubbs Memorial” night at Wrigley Field. Those who attended received a replica of his rookie card from 1962. Just four days before, on June 22, a game at Wrigley between St. Louis and Chicago had been canceled after Cardinals pitcher Daryl Kile was found dead in his Chicago hotel room. After his death, the Ken Hubbs foundation was created, with the aim of honoring a high-school athlete who has succeeded not only on the field of play, but also in the classroom and the community. The foundation received donations from across the country. Half of the profits from ticket sales for the Cubs-Los Angeles Dodgers game on May 4, 1964, was to be given to the foundation. But Dodgers owner Walter O’Malley instead turned over the profits from all of the tickets that were sold, giving the foundation an immediate $5,000 boost. Young Holly Schindler’s simple note summed up the feeling of many, from Colton to Chicago, and beyond. 1 Peter Golenbock, Wrigleyville (New York: St. Martin's Press, 1996), 382. 2 Fred Claire, “Lidle Tragedy Stirs Memories of Hubbs,” MLB.com, October 16, 2008. 4 Pittsburgh Press, March 3, 1964. 5 Philadelphia Evening Bulletin, February 17, 1964. 6 Chicago Daily News, April 14, 1962. 7 Pittsburgh Press, August 30, 1962. 8 Ken Hubbs Hall of Fame File. 9 The Sporting News, September 15, 1962, 33. 10 The Sporting News, November 17, 1962, 5. 12 Ken Hubbs Hall of Fame File. 14 The Sporting News, April 18, 1964, 9. 15 Chicago Sun-Times, July 9, 2003.